NASHVILLE, Tenn. (April 03, 2012) -- The Air Warrior system, an aviation life-support and communications ensemble first fielded in 2004, and designed for Soldiers who work aboard rotary-wing aircraft, was designed for use between five and six hours of flight time. The system is now being used by Soldiers at double that time. "Our aircrews are flying in excess of 11 hours," said Lt. Col. Ian Klinkhammer, product manager Air Warrior. The Army plans to eventually replace the Air Warrior system, on display here at the 2012 Army Aviation Association of America conference in Nashville, Tenn., with the lighter-weight Air Soldier System. While Air Warrior is performing well -- Soldiers in Afghanistan are even getting the equipment in the Operation Enduring Freedom camouflage pattern -- the system is heavy. What the Army wants to bring to the cockpit with a new aircrew ensemble is reduced weight and improved situational awareness, Klinkhammer said. The solution is the Air Soldier System. "Our goal is to reduce weight and bulk by 25 to 40 percent," Klinkhammer said. The Air Soldier System should also improve Soldiers situational awareness. "We need some better capabilities with the heads-up display, and the 3D symbology, along with the sensors, so that they are able to fly into the last 50 feet as they land to get out of that controlled flight into the terrain and also fly out of that same environment." Klinkhammer spoke April 3 during the 2012 Army Aviation Association of America conference in Nashville, Tenn. The Army is working now to replace the Air Warrior System with the Air Soldier System, a lighter-weight ensemble, with reduced bulk and improved capabilities. The system will be fielded, initially in two sub-increments: the first, 1a, in fiscal year 2015, and the second, 1b, in fiscal year 2018. In that first sub-increment, replacing the Electronic Data Module that is currently in Air Warrior, is a personal electronics computer and display system, in three components. Included in that is a Solider computer module, or SCM, a personal display module, or PDM, and a mission display module. The PDM will be wrist-worn and will help a Soldier monitor the systems he's wearing, Klinkhammer said. "You can look down at one source and see all those displays and see how much battery power you have, and how much coolant you have and how much oxygen you've got," he said. The mission display module interfaces with a platform's sensors. The SCM, "as big as a pack of cigarettes" will do processing for the systems, but also for oxygen and cooling systems. Also in the first sub-increment is the common helmet mounted display, which includes a common flat-panel display with integrated head tracker and 3D degraded visual environment symbology. 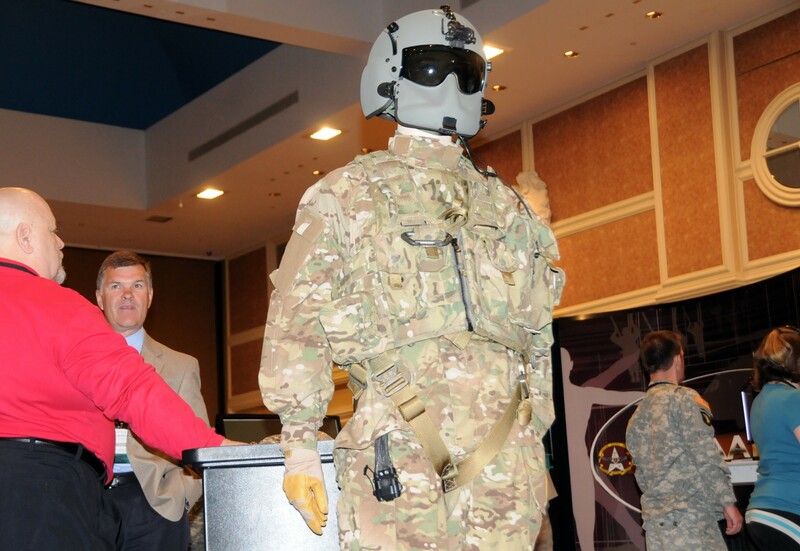 "You have a see-through display that has symbology based on the capabilities of the aircraft," said Col. Will Riggins, of Program Executive Office Soldier, the headquarters agency that will eventually field the Air Soldier System. "What the system is designed to do is make the pilot safe." Riggins said that the symbology on the helmet display can illustrate friend, foe, weather and terrain, for instance. "Every time you land, you land in a sand storm, because it kicks up everything around you. So it helps you see where all that is as well, where your friends are, where the bad guys are too -- threats." Also included in increment 1a of the Air Soldier System is an improved cooling vest that is 40-percent lighter than what is currently offered, and a layered clothing ensemble that reduces to three layers what is currently offered as seven. There is also a lightweight environmental control system, an integrated Soldier power and data system, lightweight soft body armor that reduces weight and bulk 30-40 percent, and 72-hour survival items. Sub-iteration 1b of the Air Soldier System includes a wide field-of-view/high resolution head-mounted-display for the AH-64 Apache initially, but with support for future platform sensors. The 1b sub-iteration also includes enhanced laser eye protection and an integrated protective ensemble that includes an integrated flotation device. The legacy Air Warrior system weighs in at about 99.6 pounds. By the time the Army fields sub-increment 1b of Air Soldier System, aviators will have an ensemble that has been reduced in weight to about 72.5 pounds. The Air Soldier System will also reduce the number of batteries from seven to one, and will reduce the number of displays from four to one. Total electronics weight will go from 9.7 pounds to 3.2 pounds, and the number of connections to the aircraft will be reduced from five to three. Right now aviators are still wearing the Air Warrior system. That system is still being improved upon, Klinkhammer said, and right now, just about every Soldier that needs the gear has access to it. "For the most part we're pretty much complete with all fieldings of that gear," Klinkhammer said. The Army is even stockpiling the Air Warrior gear now for the 13th Combat Aviation Brigade, and will field equipment to them in 2013-2014, "to get those guys ready to go into the fight." Part of the current Air Warrior system, the HGU-56/P integrated helmet system with laser eye protection, will get magnetic tracking for Apache Block III pilots, Klinkhammer said. That is coming off the production line now, he said, and will be fielded as the Block III Apache is fielded to units. There is also enough of the Portable Helicopter Oxygen Delivery System equipment available, he said, to field to four Combat Aviation Brigades. That equipment is being used, reset and re-fielded to those who need it. The latest addition to Air Warrior includes two Electronic Data Manager, or EDM, systems for use aboard aircraft, and they are enhanced as part of EDM 3.5. That includes a 1.6 GHZ system processor, two gigabytes of RAM, a sunlight-readable and night vision goggle-compatible display and the ability to host dynamic terrain and obstacle avoidance. The Black Hawk UH-60A and L aircraft will see the dual EDM in May or June, Klinkhammer said, and the Chinook will start seeing it in November or December.